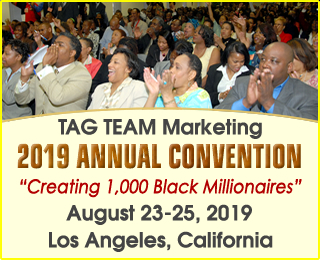 Hosted by: TAG TEAM Marketing International, Inc.
Black people are coming from all over the world to attend the epic, 3-day TAG TEAM Marketing / Buy Black Movement Annual Convention in LOS ANGELES, CALIFORNIA! If you want to change your life and financial future, don't miss this powerful event! How are we on our way to creating 1,000 Black Millionaires? The secret is TEAMWORK. By working TOGETHER, we are achieving the impossible. Black people are participating in the Buy Black Movement and earning like never before. At the convention, learn how you can become a massive success and make a huge difference in the Black community. We will be making MAJOR ANNOUNCEMENTS and debuting NEW RELEASES that will greatly advance the movement. Learn exactly how we will create 1,000 Black millionaires and how you could become one of them. 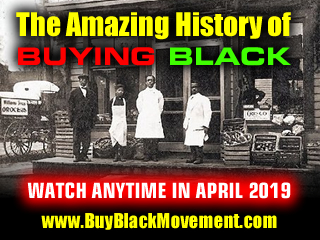 THE BUY BLACK MOVEMENT IS CHANGING THE WORLD! TAG TEAM Marketing's Buy Black Movement program is changing the world! Over 68,000 Black people have joined from 156 countries around the world. Over 136,000 Black-made products and services have been sold, shipped and delivered to Black consumers so far, making this the fastest growing and most successful movement of our type in the world today. TAG TEAM Marketing has recycled millions of dollars back into the Black community, so far.. and we are just getting started. During the three-day convention, you will receive LIFE-CHANGING training from top earners and industry legends. You will learn how you can earn incredible income in the TAG TEAM Marketing Opportunity. You will learn how promote, market and sell, build teams and more. These techniques are tailored to the Black community, have helped many Black people becoming millionaires, have produced hundreds of millions of dollars in revenues, and can help you in all areas of your life. This will truly be a life-changing weekend! Become a powerhouse in these three incredible days and make your financial dreams come true. Get ready to enjoy of the greatest weekend's of your life. Many people who have attended our past conventions say they were the most fun they have ever had in their lives. The entire weekend is very interacative and fun. Enjoy learning by practicing and roleplaying during our interactive training exercises. Meet great people. Have the time of your life! During this weekend you will meet and rub elbows with ALL of the top leaders in the movement, the co-founders, Marketers, Suppliers and Supporters. Meet some of the most powerful and productive Black people in the world today, who are all deeply committed to the upliftment of our race. Their powerful presentations will INSPIRE YOU beyond words! 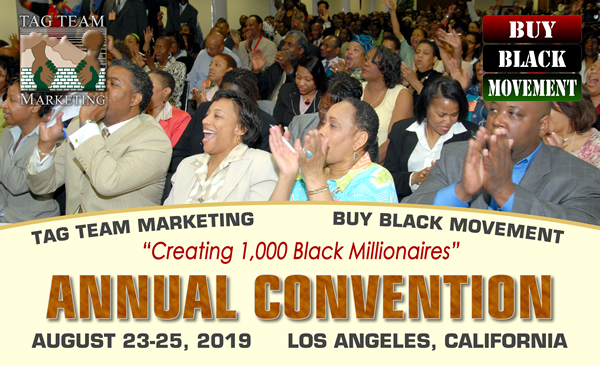 The Buy Black Movement is going to ANOTHER LEVEL at this convention! Be the first to hear all of the incredible news, tremendous announcements and product launches! It will be EPIC! Furthermore, get detailed training on how to take advantage of each of them. Hear all of the exciting future plans of the movement! Shop for top-quality, Black-made products and services at the convention. Meet many of the amazing Suppliers (Black business owners) in our Black Business Network Supplier program who will be vending during the weekend (vending is only available to Suppliers). Hear about, see and touch the new products they will be launcing at the convention. On Saturday evening, enjoy the Red, Black & Green TAG Awards Gala. See the top Marketers, Suppliers and Supporters awarded for their amazing accomplishments. * All Supporters in attendance at the convention will be recognized and awarded. You will literally become a part of Black history by attending this historic gathering of the most important grass roots movement of our generation. The Buy Black Movement is changing the world. The pictures, video and memories from this event will be celebrated 100 years from now. Be one of the lucky people who will be able to say, "I was there!" The convention starts at 12 noon on Friday and ends at 6pm on Sunday. Attire is business casual all weekend, except for the semi-formal TAG Awards Gala. We have negotiated a special package for TAG TEAM Marketing Convention attendees. ** RESERVE YOUR ROOM NOW BEFORE OUR BLOCK FILLS UP. YOU MUST RESERVE BY AUGUST 3RD (if rooms are still available) TO GET OUR DISCOUNTED RATE, FREE BREAKFAST, BE IN THE TAG TEAM GROUP, ETC. We recommend that you travel and arrive on Thursday, August 22nd, so you are rested and ready to join the convention at start. If you arrive Friday, please remember that normal hotel check-in time is 3pm (after the convention has already started at noon). You can check out on Sunday or Monday at the same discounted rate. Hotel checkout time is 12 noon. The hotel features free high-speed internet, a fitness center and restaurants on-site. 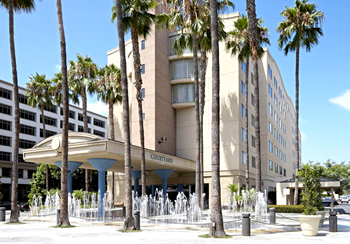 If you fly into LAX (Los Angeles International Airport), you can catch their free shuttle to and from the hotel. If you do decide to rent a car, you have to pay to park it (all hotels in the area charge for parking). They offer valet parking, normally for $35/day. There is no self-parking. We have negotiated it down to $25 per day for TAG TEAM Convention attendees. We have also negotiated a $12/day rate for local attendees who attend the convention but do not park overnight. It has been said that you are not really "IN" the Buy Black Movement until you have attended a TAG TEAM Convention. Don't miss it! Get inspired and motivated beyond words at this powerful, historic event! Have the time of your life! There are limited seats at this convention. Seats are going fast! Don't wait. If you want to change your life and be a part of history, REGISTER NOW! Tickets up to $249 at the door. Get your ticket at a huge discount by registering EARLY! 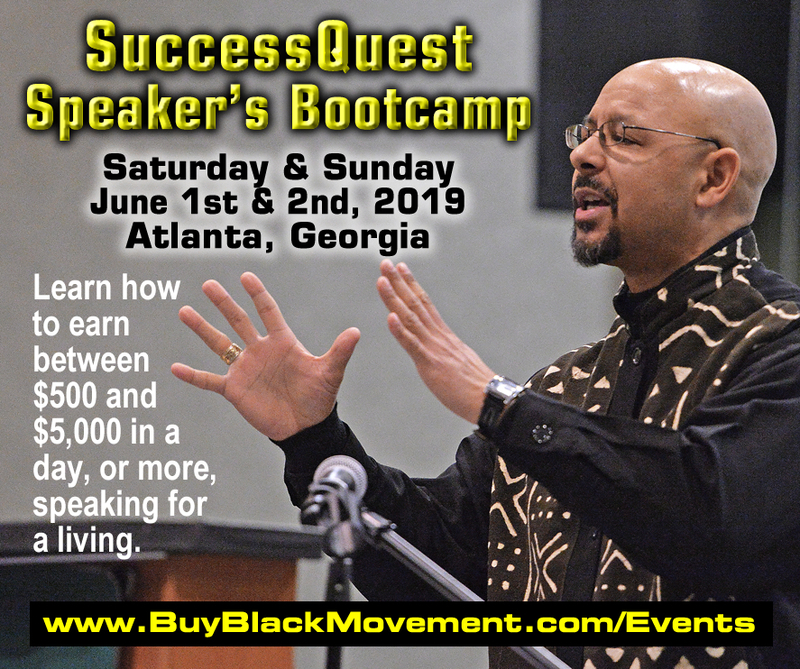 Must be a member of the Buy Black Movement to attend (free to sign up).